Northern Voices: Jolly jaunt to Israel by Tameside Labour MPs causes outrage! Jolly jaunt to Israel by Tameside Labour MPs causes outrage! Tameside Labour Friends of Israel - Jonny Reynolds & Andrew Gwynne on recent trip to Israel. 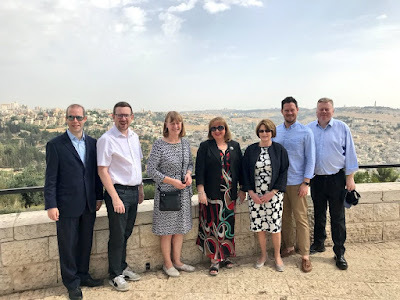 A group of Labour MPs have caused outrage by taking a jolly jaunt to Israel and posting tourist-type photos of themselves, shortly after the killing of over 60 Palestinians, which included eight children under the age of 16, at the Gaza barrier on 14 May 2018. At least 2,400 people were also wounded. The tweeted picture of six Labour MPs and a Labour peer, includes Jonathan Reynolds MP (first left), who represents the constituency of Stalybridge and Hyde and Andrew Gwynne MP (second left), who represents the Denton and Reddish constituency. Although the trip has been described as a "parliamentary delegation", the group are all members of Labour Friends of Israel (LFI). Jonathan Reynolds is currently one of nine Labour LFI officers in Parliament and Andrew Gwynne is a former Chairman of LFI and is now a LFI supporter. During their visit to Israel the group met with the Israeli Labour leader, Isaac Herzog, an advocate of disengaging with and fencing off Palestinians. Israel is often described as the only real democracy in the Middle East. Yet it is a racist and an apartheid state, where the Israeli Prime Minister can describe Arabs as beasts, and where Palestinians are prevented from marrying Palestinians living outside Israel or from returning to their Palestinian homeland. Arabs are also prevented from living in hundreds of Jewish communities under the 'Access to Communities Act', which allows existing residents to bar Arabs from renting property there. Many Israeli settlements that have been built on the West Bank are also illegal under international law. In 2017, a young Israeli Embassy official called Shai Masot, was caught on camera plotting to 'take down' UK MPs who have been outspoken supporters of a Palestinian state. He was filmed asking a UK civil servant Maria Strizzolo, "Can I give you some MPs that I would suggest you take down." Masot had links and was sending funds to various groups including, the 'Fabian Society', 'Labour Friends of Israel', the 'Jewish Labour Movement' and 'We Believe in Israel'. In what is beginning to resemble a McCarthyite witch-hunt, a number of Labour members including the Labour leader Jeremy Corbyn, have been accused of anti-Semitism or of infringing Labour Party rules for criticising Israel and its policies towards the Palestinians. Jonathan Arkush, president of the Board of Deputies of British Jews, recently accused Jeremy Corbyn of "siding with anti-Semites." Jackie Walker, the vice chair of Momentum was removed from her position when she said many Jews including her ancestors had been the chief financiers of the sugar and slave trade. Ken Livingstone was suspended by the Labour Party when he said that the Nazi's and Zionists had collaborated when they drew up the Haavara Agreement in 1933. Labour Party member, Jean Fitzpatrick, was denounced as an anti-Semite when she asked how a two-party state in Israel could be achieved in the face of the "atomisation of the West Bank." It is highly unlikely that Shai Masot would have had Reynolds or Gwynne in mind when he talked about "taking down" certain MPs. The dynamic duo have long-standing links with LFI and are almost Zionist poster boys. Slaughter or no slaughter, both MPs have issued statements defending their decision to go on the Israeli trip. "I was interviewed alongside a holocaust survivor. She begged me...to visit Yad Vashem - the Holocaust memorial in Jerusalem. I agreed and this Whitsun Recess has been my opportunity to make good on my word...That I've honoured my commitment...I hope will be recognised for the right intention." Jonathan Reynolds said that he had taken the opportunity to attend a delegation of Labour MPs to Israel and Palestine. "This will be my fourth visit to the region since I first went in 2004. Wherever you go within Israel you see Muslim, Jews and Christians living their daily lives alongside one another. Israel is the only real democracy in the Middle East and the only country where minorities have full equality before the law. The result is a truly dire situation for the people of Gaza, as evidenced recently by their willingness to effectively walk into live gunfire in their desperation." 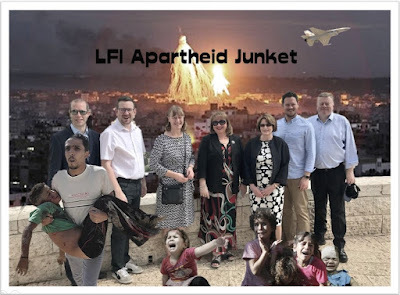 Unlike the Labour MP Catherine West, who demanded that her name be removed from the LFI website and utterly condemned the actions of the Israeli army in Gaza, Reynolds and Gwynne have not issued statements condemning the massacre at the Gaza barrier in May. Although reports have suggested that many of the people who were killed were shot by Israeli sniper fire, Reynolds would have us believe that the Palestinians brought about there own deaths by effectively, like lemmings, walking into live gunfire. What Reynolds does as a LFI officer in Parliament isn't clear, but no doubt, many of his constituents would be keen to know who paid for his trip to Israel and whether he notified his CLP of his intended visit and whether Stalybridge CLP members, endorsed the visits and the comments that he has made. It is also curious that neither Reynolds or Gwynne ever mention on their election leaflets, their involvement in Labour Friends of Israel. The public have a right to know.